For five days, from August 27 to September 2, the staff at Neuchâtel Junior College worked together to prepare for the school year, one that for both the students and the new teachers will be like no other. 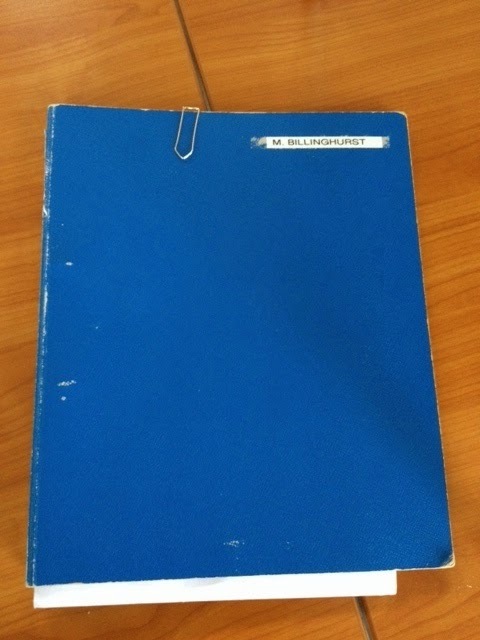 During that time, I have been a student as much as I have been a teacher. In total, I have been in meetings about 18 hours. There is so much to learn! I will be helping some of the students prepare for this exam. We at NJC are working with young people who will be seeking University entrance next September. As a result, led by Jen, our Guidance counsellor, all of us need to be able to address basic questions about University preparations. Some of our discussions addressed ways in which we can advise our students about options for their futures. 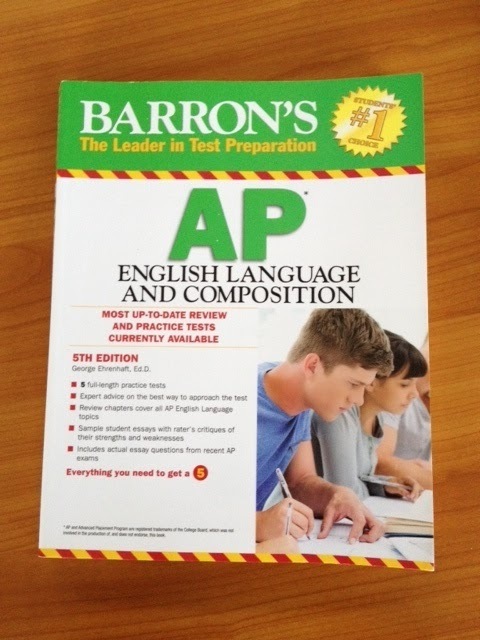 I, for one, will be familiarizing myself with the AP examinations, which can give students an advantage in many American and Canadian schools. Fist Aid instructor, Claire Thomas, practices her skills on Aaron. The students are also, obviously, far away from home. This means that the teachers and office staff must act "in loco parentis" more than we would in Canada. 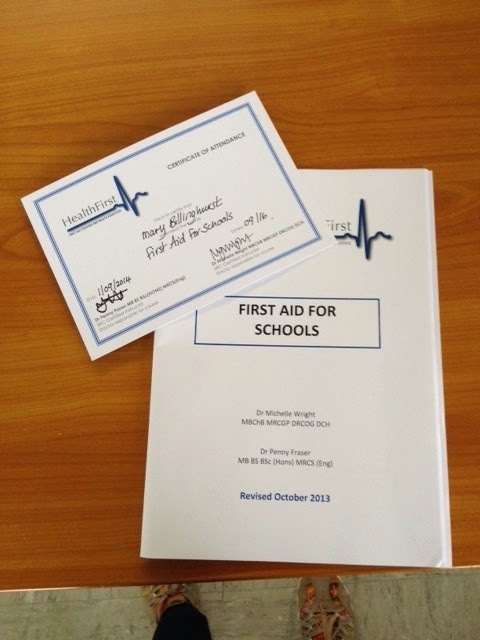 On Monday, the new staff spent an afternoon being trained in First Aid. I now know how to stop bleeding, wrap a sprain, move a body into the recovery position, and when to call 144 (that's 911 in Canada), among other useful things. I passed First Aid - and I didn't faint. Computer whiz, Diego Corti, spent Tuesday morning training us in the systems the school uses. I am new to Google Drive and File Maker Pro (somewhat), so I am on a learning curve with this technology too. Fortunately, Diego is very kind and helpful and I am confident that, with his help, I will catch on to everything very soon. Diego, the best tech support ever. Understandably, a lot of our time in meetings has focused on the activities planned for the upcoming school year. We will be very busy outside of our classrooms with clubs and teams, as well as European travel adventures. September is an especially important month in the school calendar, since this is the time to build relationships. The ten students in my "advisee group" will be a unique kind of home form. I will meet them first during Orientation week in Locarno, and we will continue to meet regularly all year. I suppose I will be a sort of "den mother" to them. Besides meeting at the school, the staff has also had two less formal gatherings in the evenings. 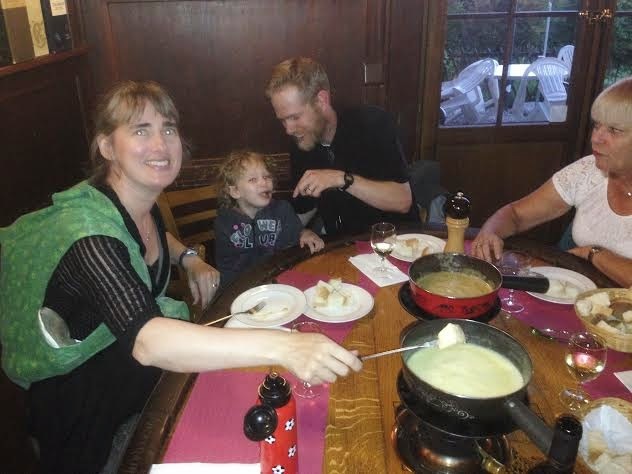 On Monday, the entire staff and their spouses went out - and up - to Pinte de Pierre-à-Bot, a fondue restaurant above the town. This was a great team building experience. There were many choices of fondue available. Ours had mushrooms in it - so delicious!! 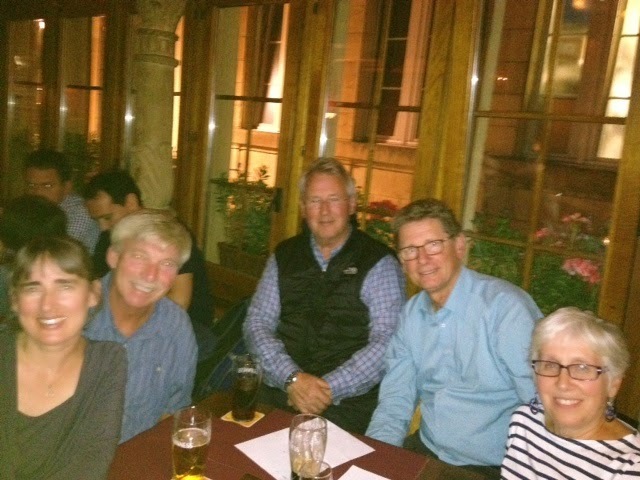 Tuesday evening, a few of the teachers went to the local Irish Pub for trivia night. Isn't it amazing that there is such an event in Switzerland? The questions are all in English! Our team, the Canucks, performed well, placing third. This has been a week of growth for me. I am ready for the next phase of the year - the arrival of the students. Let the games begin!